Just keep talkin. You are making my case for me. What is it about product launches that brings out all of the drama queens? no sir you have it all wrong your zeal on bringing the so called truth is mind boggling remember sony dat tec? or Betamax and the list is so long of failed items its scary.and digital cameras I got a box point and shoots plus the majic memory sticks don't even say sony is best its not. I'll tell ya. The best thing I ever did was leave this nutsy forum and just DO photography. . So feel free to continue staying away. Oh - and the best thing you could ever have done was learn how to convert and post-process your files properly: because all I ever saw, when you posted up images to "prove" this problem or that failing, was someone who had no idea what to do with his files once they were off the camera. Presumably you'll have found the time to do that, now you're not distracted by CR? I care that I switched and I am sharing my opinions as to why. What's so obnoxious about it?. Interesting that your website is still full of 7D wildlife images then, don't you think? Where are all the superlative Sony shots that blow Canon out of the water? I suppose we'll be waiting a while for them, eh? I have been doing astrophotography for years now, and it dominates what I do. I work with quite a few different kinds of cameras, and have processed data from dozens of different kinds of cameras, including DSLRs as well as scientific CCDs, astronomy CCD and CMOS cameras, etc. Sensors from Canon, Sony, Panasonic, Kodak, OnSemi, Aptina, and others. I routinely work with signals orders of magnitude fainter than anyone doing terrestrial photography works with (fainter than starlight, and starlight is darn faint!!). I know how to process just fine. I am intimately familiar with faint signals and how to extract the most from them, and how different cameras compare in terms of noise and signal quality. This is some of the most beautiful raw data I've ever worked with, and acquired with a relatively modest aperture...and with very tiny pixels. Canon data doesn't come close to this kind of quality. I've processed very faint signals from every major Canon DSLR on the market (I now understand that Canon's sensors suffer from relatively high FPN, which is more of a problem for them than other noise terms, and even with dark calibration, their FPN is often unstable and does not always correct properly). I also use a Panasonic sensor regularly, and it performs very well as well...and in some respects, is actually superior to most of the Sony sensors I use. The only thing that can top the Sony IMX183 and Panasonic M IQ is data from a KAF-16803 (originally Kodak, now an OnSemi CCD sensor with very large pixels and immense dynamic range) when paired with large telescopes...however the camera alone costs at a minimum ten grand, and telescopes that can deliver comparable results with this KAF camera tend to cost eight to twenty grand or more. The KAF-16803 also requires some fairly extensive total exposure time with long individual exposures when operated at similar image scales (here, ~0.82"/px for the image above). Jon, great shot! Is the Sony sensor much different from the one they use in the latest RX100 and RX10 series? Thank you for sharing your experiences and knowledge. I sometimes really missed that. I think it is clear to all (even the Canon fans) that Sony sensors are better than Canon sensors, esp. when it comes to low light and/or low ISO. Some are not willing to state that and that's sad. I did a quick search for that IMX183 and only found some dedicated astro cams and some rumors from 2017 that it could be in RX cameras. Can you tell me if it is used in any "consumer" camera? If not I suppose that you can also admit, that this is a dedicated tool for a really special purpose. Isn't it? And before you think I want to start that "... more than just the sensor ..." debate, no I won't. Of course it stands as example for other Sony sensors that are built in "consumer" cameras and I want to understand your input in a better way. I would be also interested in how you use it. I suppose you you do quite long exposures and read out the raw/base data. Just in general: How do you read out and proceed that data? As I am not into astro that much I don't want to get too much into detail. Very beautiful, and quite accomplished. It is...trolls and passionate people do not mix well. This site still supplies me with valuable insight, though, and on occasion, superlative images, such as the one you just posted. Thank you! The IMX183 is actually a different sensor than the one used in the RX100. The RX100 uses an Exmor RS sensor, which is actually arguably BETTER than the IMX183 sensor I am using right now. The IMX183 is a machine vision sensor, and it has some amp glow, a kind you would never see in a mirrorless photography sensor. There are some astro cameras built on Sony Exmor sensors, including the IMX128 and IMX094, which are used in familiar cameras like the D810 and D750. Sony Exmor sensors are, IMO, the best there is. The IMX183 is a good sensor, with significantly lower noise, vanishingly low FPN, and overall a much cleaner noise profile in general than any Canon sensor, but it is still not quite as good as an Exmor sensor. The key issue with amp glow is, you really cannot use the data without calibrating it properly. Calibration requires subtraction of a master dark frame. For normal photography, which is usually composed of a single frame, calibration is never done and usually not an option with the commonly used raw processing software. When calibrated, the IMX183 has amazing characteristics, but that glow does put it a step behind the Exmor sensors when it comes to cutting edge strait out of camera IQ. The read noise of the IMX183 is very low, and in fact may even be lower than a lot of the Exmor sensors, and it has ultra low dark current (around 0.002e-/s), and its noise profile is just wonderful. For the tiny 2.4 micron pixels, it actually has a rather larger 15,000e- full well capacity, which is a bit of a technical feat in and of itself. The IMX183 also comes in monochrome versions which work better with astrophotography imaging filters. If I had the funds, I'd get an astro camera with an IMX128 or IMX094 in it. These are the full frame sensors used in the D810, D750, A7r, etc. They are amazing sensors. Sadly they also only come in color versions, there are no mono versions, which limits their versatility for astrophotography. Still...two of the best sensors on the planet at the moment. For LRGB imaging (luminance and RGB), exposures are usually in the range of 30-90 seconds. 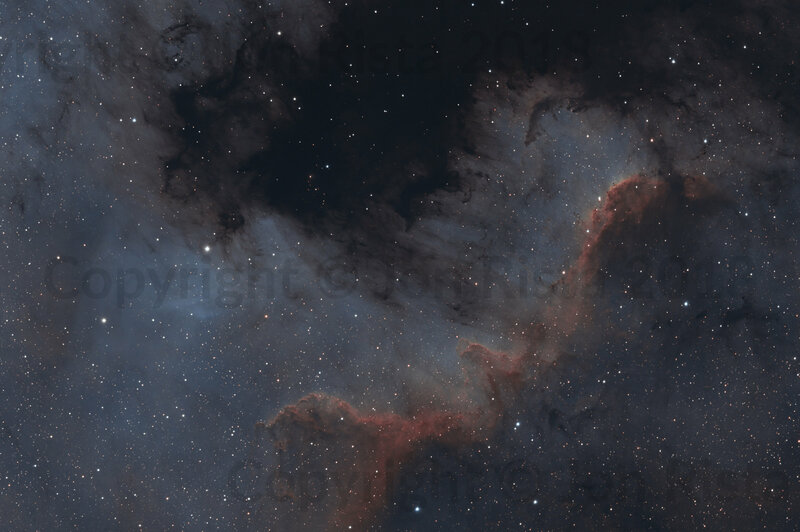 This can actually present a bit of a challenge, as with astrophotography we work with signals so faint that and yet objects with such immense dynamic range that a single exposure is insufficient to capture enough of the faint signal without clipping too much of the bright signals (i.e. stars, galaxy cores, etc.) We have to compensate for that by stacking lots of individual sub exposure frames together. When exposures are only 30-60 seconds, but we need several hours of data in total to produce an image with good SNR (again, we are working with signals many orders of magnitude fainter than starlight, and orders of magnitude fainter still than the darkest shadows anyone might pull out of a terrestrial photo), which can mean stacking hundreds of frames. That can get a bit tedious once you get beyond about 200 frames, as disk space, cpu and memory requirements start to skyrocket when you need to handle 300, 500, 1000 frames. With narrow band, where signals are again orders of magnitude fainter STILL, we sometimes get an object photon once every minute or so! It can take several minutes to pick up enough photons to produce a usable photoelectric object signal in each sub in the faintest areas of the object. So even with 10 minute subs, we may only have a few electrons worth of signal. I usually stack around 60 10m subs, which is 10 hours of exposure. Such an integrated exposure may, finally, have a signal reminiscent of the shadows in a normal terrestrial photo. Jon has been an inspiration to me. His images show what is possible and he is generous with advice. I am glad to see him back on the forum and look forward to see what the future brings. Personally, I have been getting into astrophography as well. My understanding is that the most important gear is a good tracking mount and astroguider, and knowing how to process images and what type of images to take is far more important than camera choice. I have not tried taking any pictures through my telescope since I used slide film over 15 years ago. I imagine that the old Canon mount for the telescope might work with my current digital bodies, but I haven't tried. Light pollution around here is too great to photograph much of anything. Even back then, I don't think the clock mechanism was that accurate. I got some decent shots of Jupiter, but didn't try Saturn, though it was relatively close at the time and looked good through the telescope. An exposure long enough was too likely to be a blur, so not worth wasting film on. Also eyeballing the angle to Polaris with my equipment that is rather primitive by modern standards would have given even more of a tracking error. So I would be interested to know what you come up with in method, equipment, subject matter, even though I'm not gung ho enough to travel to dark places and try my hand.